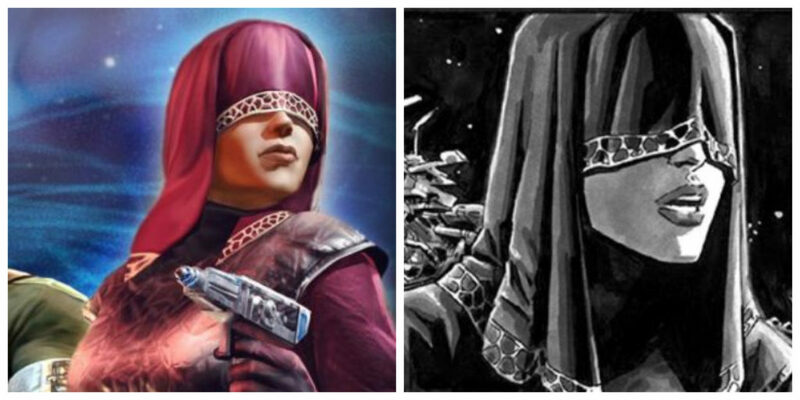 The image on the left of Visas Marr originated from the Knights of the Old Republic II: The Sith Lords Offical Game Guide. It can now be found on Marr’s Wookieepedia page (link below). The image on the right is from Star Wars Tales 24. Visas Marr was a Miraluka with a strong connection to the Force who debuted in the video game Star Wars: Knights of the Old Republic II: The Sith Lords. You can also find Visas Marr in the game Star Wars: Galaxy of Heroes and the comic story “Unseen, Unheard” from Star Wars Tales 24. Kelly Hu voiced Visas Marr in Knights of the Old Republic II. Learn more about Marr on her Wookieepedia page. And here’s a video about Visas Marr from 100% Star Wars.